First, I needed to narrow the list of apps, so I set some basic threshold requirements for any apps I would review. Once I had my list of the best available email apps, I selected what I felt was the most relevant criteria to compare the email apps and determine which was the best. 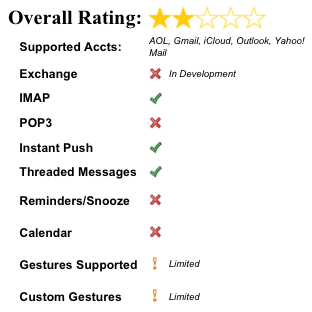 Performs all of the standard email functions (compose, reply, delete, archive, mark as spam) simply and effectively. Apps not meeting those particular standards were not considered. Note: The apps on this list are all highly rated, and well received by tech writers and reviewers. The ratings below are not meant to be compared with other reviews, but rather my relative comparison of the apps to each other. 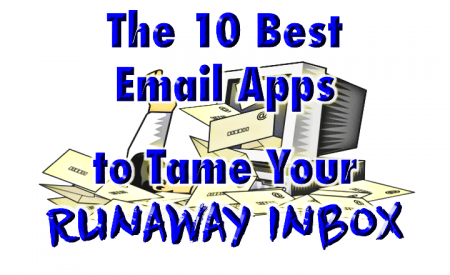 Based on my research, the “worst” of these email apps is better than those not included. Advanced and unique features (including how useful they are in managing your email inbox). 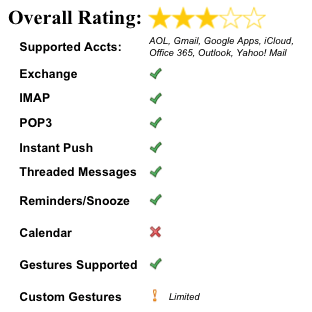 Microsoft’s relatively new entrant into the app market, based on the successful Sunrise Calendar app purchased by Microsoft in 2014, is the best overall combination of basic email tools, advanced features, and regular (and significant) upgrades. While Outlook has the strongest overall system (when you include it’s Android app), it was impossible for me to omit the newcomer email app Spark from this list. While there are still some growing pains, Spark’s intelligent algorithm, which identifies and prioritizes important emails as they arrive in your inbox, could fundamentally change the way we use email on mobile devices. For Android devices, however, the native Gmail app is the clear winner. Boasting greater third-party compatibility than it’s iOS version, the Gmail email app is everything we’ve come to expect from an email app. Probably because Gmail has taught us most of what we know about email. Boxer is one of the best email apps for power users – those who want/need to fine tune every aspect of their email app to meet certain tastes or requirements. From push notifications to Gesture Command, very little of Boxer cannot be adjusted to fit your preferences. The ability to expand beyond the initial structure of an app is a huge advantage, when applied. Really, third-party integration should almost be called “External Customization,” as users are able to change the way the app works based on the integration services they utilize. Of all the apps I reviewed, none come close to the options provided by Dispatch. While some apps offer limited integration with third-party productivity systems, none have as many options as Dispatch. But not satisfied to simply connect with to-do lists and calendars, Dispatch also integrates with tools like SalesForce, 1Password, and numerous others. The options and combinations are nearly limitless. Click on any app to jump to the specific review. The Airmail app is the mobile version of the popular Mac email client. Highly customizable, Airmail is great for power users who are looking for an email app that they can adjust to suit their needs. Custom snooze options, highly configurable gesture controls, fast document preview and in-app PDF creation (searchable), numerous third-party integrations (including ToDoist, Wunderlist, Fantastical, Trello, Evernote, Pocket), and one of the fastest Search features available. 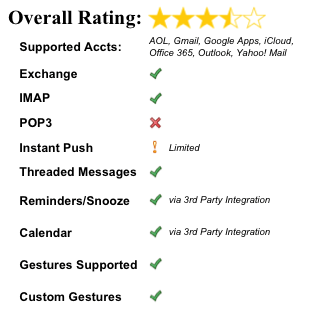 Limited confirmed compatibility with other third-party email systems, despite being compatible with Exchange, IMAP, and POP3. Airmail is a fantastic email system for Mac, and its users are undoubtedly happy to see it finally arrive on iOS. For users who rely on the ability to search through their inbox, the incredible speed with which Airmail performs this task will be a huge time saver. However, I just don’t use search that often in email, and speed hasn’t been a major concern of mine. To me, this is a nice feature, but doesn’t truly improve Airmail’s utility significantly (just my opinion!). Airmail does have great customization options, Gesture Controls that are better than most of the email apps on the market, and some excellent third-party integration options. If you’re looking for an app that you can customize to meet your every need (and don’t mind the extra work that comes with doing so), Airmail is probably worth the price of admission. Alto Mail is an app based on the premise that an email is important based on what’s in it, rather than who it’s from. Utilizing a comprehensive Dashboard, Alto Mail helps to organize and streamline the email process for even the most dedicated power users. Airmail “stacks” emails based on their content (i.e. photo attachments, documents, emails from people you know), with the most relevant emails displayed first. Instant push and customizable notifications are available, and can be unique to each account you connect. Not currently compatible with Exchange (although it is currently in development); Gesture Control is available, but is limited only to commands of archive and delete, and lacks customization options; does not include any calendar or reminder functionality. Alto Mail, compared to the other email apps on this list, is simply not quite a complete system. Yet. Despite it’s low rating in this particular review, however, I really like the direction Alto Mail is going. Given that it’s one of the newest apps on this list, it’s likely to continue to improve – fixing at least one of the gaps (Exchange compatibility) in the near future. Hopefully, its development continues, particularly in making the Dashboard and content-based organization even better. For power users, or users looking for a highly customizable email app experience, Boxer has a lot to offer. If you want or need to get some level of task management out of their email app, Boxer’s workflow-based approach is certainly worth looking in to. Built-in calendar, contact, and task management functionality; Gesture Control is a central feature, and numerous gesture commands – all of which are customizable – are available; Cloud File Integration provides ability to attach files, photos, or documents from Box or Dropbox while composing a message. 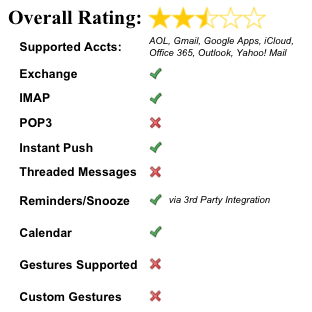 Limited third-party integration (partially due to the built-in productivity system, I would imagine), Boxer’s capabilities do not expand via outside apps like most of the other email apps on this list. It’s also priced higher than most similar apps. Boxer is a highly customizable email option that’s great for anyone who relies on their emails to serve as at least part of their productivity system. Boxer provides a great system for turning emails into tasks or calendar appointments, along with considerable options (all easily customized to fit individual needs) for replying to emails beyond what is available in most other email apps. The downside to creating such a comprehensive productivity system is that third-party expansion was largely ignored, limiting the potential utility that Boxer can provide to only those features thought of and created by Boxer’s developers. CloudMagic is all about business – whether taking advantage of third party integration to push emails to productivity and work apps, to its “Team Contacts” feature, which is perfect for sharing information with your teams. Instant push available for all types of emails, and data is pushed from the cloud, improving battery life. “Team Contacts” allows co-workers to share contact information, complete with access to prior email threads. 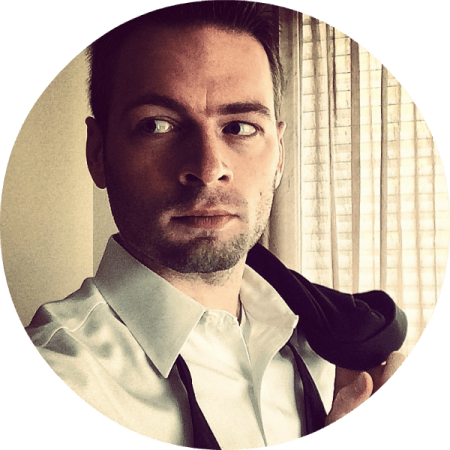 Numerous third-party integrations, including Evernote, Trello, SalesForce, and MailChimp. CloudMagic is also available on both Apple Watch and Android Wear. CloudMagic’s highly customizable interface does not extend to Gesture Control, as CloudMagic does not utilize Gestures in its design. Additionally, the inability to view Threaded Messages and the inability to modify the status of multiple emails without opening them one-by-one dramatically reduces CloudMagic’s utility. There’s no question that CloudMagic is an incredibly well-designed (beautiful, even) email app, with excellent business tools. Team Contacts may be one of the more unique tools I’ve seen, but I’m just not sure how useful it would really be. While there are great third-party integration options, and CloudMagic allows you to interact without leaving the app itself, the choices of providers are relatively limited. Although it’s an impressive app, the things CloudMagic is unable to do unfortunately cut too far into what I look for in an email app. But as I’ve said throughout this post, your preferences may not be my preferences, so it might be worth a look! Dispatch is a powerful and popular email app for iOS users designed based on a simple concept – it’s not how you get emails, but what you can do with the email once you have it, that makes the email important. 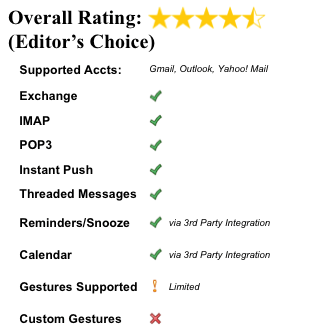 Easily the most expandable email app via third-party integration, including 1Password, Asana, Chrome, Google Maps, Google Translate, Pocket, Skype, and many more; numerous Gesture Control options available, customizable to fit the user’s preferences; save frequently used replies as “Snippets” for quick, pre-drafted responses. No support for either Exchange or POP3 email (and no plans to expand in the future, per Dispatch’s customer service); unable to view emails in Threaded view; instant push of email messages unavailable, so users must open app itself to refresh inbox. Of the email apps I tested, Dispatch is the only one that makes it possible to break down, in the moment, what the action is that needs to be taken on that email, rather than merely delaying that action until some future date or time. And it allows us to use our preferred application for processing such actions, rather than leaving us stranded in our iOS email inbox. Even with its great features, the lack of compatibility with Exchange, along with the absence of Instant Native Push, cannot be glossed over. It’s these limitations that prevent Dispatch from being, in my opinion, the best email app option for iOS users. As one of the biggest players in email, it was impossible to omit the Gmail app. 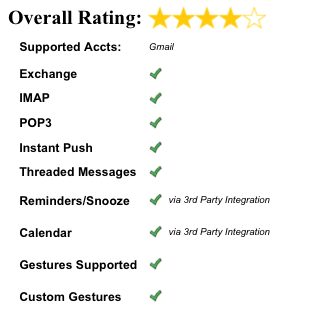 Perfect for fans of the Google Apps environment, and for Android users especially, there’s not a better email app. Gmail’s unique “Block” and “Unsubscribe” features, thread muting, actionable notifications. Left-rail sidebar allows for easy and fast navigation to Gmails numerous sections and folders. Due to Gmail being a Google product, users are able to respond to Google Calendar invites from within the app, and the app utilizes all the familiar functions available to Gmail’s web client users – archiving, labeling, starring, and Gmail’s three-tab organization. Gmail relies on Google Apps such as Google Calendars and Google Drive to perform functions other email apps include within their ecosystem, which is inconvenient. Additionally, Gmail’s compatibility with other email systems leaves something to be desired. Ok, so dealing with the elephant in the room first: this app probably needs two different ratings – one for iOS and one for Android. The Android version is the one that’s earned “Editor’s Choice,” and is the one reflected in the chart above. The iOS version would probably not make this list based on by threshold criteria (due to its incompatibility with other email systems). That said, the overall functionality of the Gmail app once you get past compatibility questions is essentially identical – and incredibly solid. With all the tools that users have gotten used to on the Gmail platform, there’s no learning curve to deal with when you use the app. Plus, those tools and features in Gmail were robust and effective, so there was no need to reinvent the wheel. Although the reliance on outside apps for certain items is frustrating, as an email app, Gmail is a great (and free) choice. Mail Wise approaches its email app with a focus on conversations. By combining emails in a clear and organized way – removing excessive formatting and signatures – and providing numerous customizable Gesture Control options, Mail Wise provides a simple and efficient way to control your inbox. Simple design strips unnecessary formatting from emails to save time and increase ease of use; built-in contacts system, which can be managed directly from an email sender’s profile picture and unique notifications based on email sender; numerous Gesture Control options, which are easily customized; optional threaded view helps declutter the inbox. Instant push is apparently inconsistent (per user complaints); Threaded Conversation view is source of a wide variety of technical problems; inability to modify or delete individual emails within a threaded conversation; lacks HTML signature options common in other apps. I’ll admit that this app was a bit of a puzzle for me. The tools and features seem to be really useful, and the ability to view email threads like a messaging conversation is something we usually see more in apps trying to “reimagine” email (i.e. Send by Microsoft Corp.). However, unlike Send, MailWise is a complete email system, with some great options that can be customized to fit the user’s needs, particularly the sender-specific notification and Gesture Control options. However, the most frequent complaints from users (who make up a small minority, this app is highly rated in customer reviews) is that features like Instant Push and Threaded Conversation views have technical issues. Although anecdotal, the complaints do cause some concern. Microsoft’s flagship email platform was brought over to both iOS and Android within the past year, and if it had any making up to do as a result of its late start, it’s definitely caught up to the competition! With a wide array of tools available, Outlook is one of our Editor’s Choice picks for best email apps. 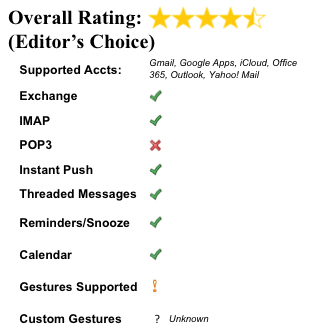 Instant push support for all accounts – including Gmail; built-in tools for calendar and task management; divides emails into “Focused” and “Other,” based on “smart” interpretation of prior communications; integrates with Office 365 and Google Apps productivity suite apps and systems; constantly receiving significant developer attention, resulting in frequent updates that provide significant enhancements to the app itself. Only offers limited gesture commands, and the ability to customize is unknown. Outlook may be a relative newcomer to the field, but it certainly acts like a seasoned pro. On its release date, Outlook was already considerably better than most apps are at the start, resting on the benefit of Microsoft’s considerable program experience. More importantly, Microsoft is taking advantage of its resources to regularly push major improvements and upgrades to the platforms. When you have a good app that regularly gets significant improvements, you’re going to be good. About the only thing that Outlook doesn’t do all that well is Gesture Commands. But I’m sure there’s an update coming soon that’ll take care of that. Spark is another recent entry into the email app market, and it’s blowing people away. Taking “smart” features to the next level, Spark uses a proprietary algorithm to adjust to your preferences. The more you use it, the smarter it gets. 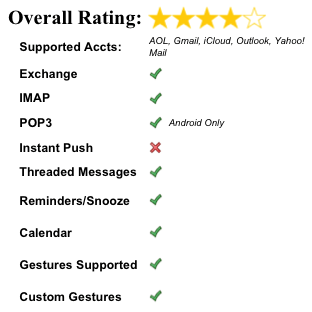 Offers the most advanced Gesture Controls of any app on this list, all of which are fully customizable; smart notifications inform user of important emails (based on proprietary algorithm); Quick Reply feature allows quick responses to messages without composing full email; advanced filters identify important messages and groups unimportant emails (mailing lists, notifications) together for review. Lacks calendar functionality (neither built-in or third-party integration option available); very new to the market. Outlook is the present, Spark is the future. One of the biggest selling points for many of the apps on this list is the options users have to customize the app to suit their needs. However, in order to take advantage of those options, users have to dedicate a fairly substantial amount of time setting up those options. Spark is the first that learns from you, and customizes itself for you. Beyond its smart algorithm, Spark is also an excellent email app straight “out of the box” already. If Readdle gives adequate support to updating Spark’s capabilities, watch out. TypeApp (a.k.a. “Type Mail,” a.k.a. “Blue Mail”) offers a wide and versatile set of capabilities to help manage your email efficiently and optimize your productivity. One of the only apps that boasts universal access and full instant push, along with numerous customization options, TypeApp is a high quality email app for Android users. Smart, customizable push notifications, unique to each account, including the ability to set “quiet hours.” Designed for ease of use, with quick filters prominently displayed and fast navigation between email accounts. No calendar functionality; limited customization of Gesture Controls; lacks third-party integration tools. Type Mail is an incredibly solid email app, and is an excellent alternative to the stock email app. It should be noted that although Type Mail lacks a lot of the functionality that I was looking for in this review, it’s user base is large and passionate, and it’s one of the best reviewed email apps on the Google Play Store.